Share the post "Remembering Marjory Stoneman Douglas and Her Rich Legacy"
As we watched the news of the tragic events at the high school in Broward County in South Florida, I wondered how many of us connected the oft-mentioned name of the high school with the woman – and her legacy – behind the institution’s name. 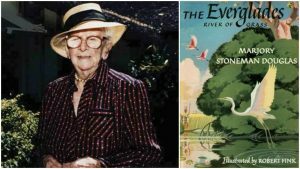 It’s a wonderful story to share with you: Marjory Stoneman Douglas was a valiant and heroic pioneer in so many ways on so many environmental and social issues. She moved to Florida in 1915 from her early roots in Minnesota and New England (she was a Wellesley College grad) when the Sunshine State was in so many ways actually really a very new state. (Miami on her arrival had but several thousand residents and was a pioneer settlement). Shortly after WW I ended there was a land boom in South Florida, with the Miami area coming alive with entrepreneurial and land and community development activity. Some pieces of Miami land changed hands 10 times with the owner not even seeing the property “they owned.” The Miami Herald – her father was the founder and publisher — carried more classified advertising (buy my real estate!) than any other American newspaper at that time. Marjory was born in 1890 and died in 1998 – her life spanned almost all of the 20th Century. She was an accomplished newspaper (The Herald) and magazine journalist, a tireless author and playwright and inspiration for female writers; an advocate for women, for civil rights, for human rights, for public health; a fighters for social justice; and a conservation leader who defended the previous Everglades eco-system for much of her life. The editors asked her to write about the Miami River, which was not really a river at all, she cheerfully responded. But then she began to research the ‘Glades” and there focused on the broad “wet” plains and the Biscayne Aquifer, giant Lake Okeechobee, and the role of the Kissimmee River in the fabled Everglades. The water was of the great stretch of wetlands was…well… moving…like a river. The ‘Glades — not quite a river there, she explained to her readers, at least not like the Rio Grande or the Hudson or the Missouri and Mississippi – but it could be seen as a river of grass. The result of her years of extensive exploration and research and working with naturalists and conservationists was her 1947 work, “The Everglades: River of Grass”. She observed that the water did move, ever so slowly, shaping everything around it. That work awakened her interest in things conservation and environmental. The Everglades was not just some, well, “swamp” – but a very important and vast and vital eco-system. The Rivers series was very successful for the publishing house. I have copies of some of the book here on my bookshelf. Including River of Grass. Which has sold more than a half-million copies in the 70 years since first appearing in book stores. It is often compared to Rachel Carson’s Silent Spring in terms of impact and influence and awakening of the public conscience. Marjory fought for many years to preserve and protect that eco-system and much of South Florida. Woe be to the “official” who stood in her way! She became known in the state as the “Grande Dame of the Everglades,” and a string of governors and other elected officials came into her crosshairs — and eventually under her sway. I had the privilege to see Ms. Stoneman Douglas in action in Florida on several occasions. She appeared quite tiny and frail in her later days. But then she began to speak…and the sparks would fly! Her tiny voice was a megaphone for protection of the environment in Florida! When I was an editor and publisher of Florida newsletters, magazines and management briefs, I constantly monitored the activities of the great lady, and came to appreciate the many achievements of her lifetime and way beyond (in the beneficial impacts on society today). Today, thanks to her efforts, the Everglades National Park is a reality, saved from the relentless expansion and growth of developed areas for which Florida is nationally-known. Open space? Pave it over! The area is also designated as a Wetland of International Significance and an International Biosphere Preserve. We can all enjoy the Big Cypress area of the ‘Glades thanks to Marjory. Lake Okeechobee is still threatened by industrial activities but it is in much better shape than it would have been had she not joined the battle to push back on the flow of fertilizers, wastes into the lake, and other impacts that threatened this precious natural resource that helps to define Florida. The U.S. Army Corps of Engineers in the late-1930s and into the 1940s made a number of bone-headed decisions for “improving” the Kissimmee River flow and the effects on the Everglades. A series of floods had caused damage to newly-developed and agricultural areas, and the rising complaints by the increasing population moved government officials to “action”. The river was “straightened out” in the 1940s and 1950s for much of it meandering course – with disastrous results. The little river flows from Lake Kissimmee, from close by to the well-visited Orlando area resorts, 100 miles south to the expanses of the Lake Okeechobee area through a wide and very flat floodplain. This is home to a rich and wide variety of natural fauna and flora. In 1948, the Corps began building the “Central and South Florida Project” to move the river to a ditch, the C-38 Canal and installed water control facilities that…destroyed the natural river. Marjory had strenuously pushed back on such modernization and “progress” — and won support for the restoration of the river; the project is still underway. Marjory Stoneman Douglas High School: The high school being named after her was in honor, we could say, of her quest for learning throughout all of her life. The Marjory Stoneman Douglas Building in the state capital (Tallahassee) is home to the offices of the Florida Department of Environmental Protection. In her lifetime she was awarded the nation’s highest civilian honor – the Presidential Medal of Freedom – by President Bill Clinton (1993). England’s Queen Elizabeth paid her a visit. The National Wildlife Federation Hall of Fame inducted her, as did the National Women’s Hall of Fame in 2000. And as we all know now, the scene of the February 2018 Parkland high school shooting tragedy took place at the high school named after her in 1990, during her lifetime. 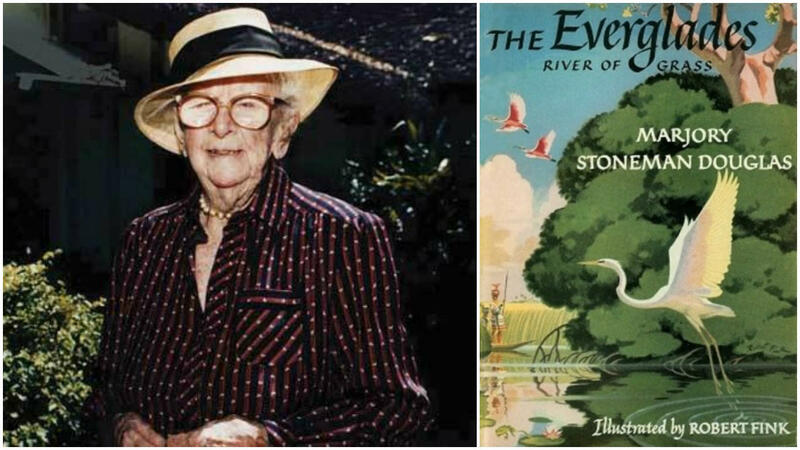 Upon her passing her ashes were made part of the land – dust-returning-to-dust, to become part of the Marjory Stoneman Douglas Wilderness Area of the Everglades National Park. And now you know more about the great lady of that name, who was a powerful voice that would very much at home in today’s sustainability movement! She would be railing (I could picture her doing so) about global warming and the rising seas. She experienced the devastation hurricanes that ripped through South Florida in the 1920s and worried about her little house in Coconut Grove – that might be underwater at some point in the 21st Century (the restored house is a National Historic Landmark).